Desk Adjuster and File Manager Contact Information. 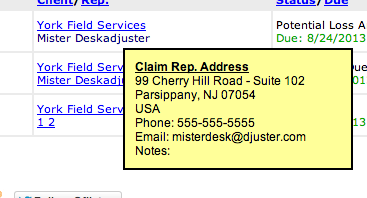 The desk adjuster's contact information can be viewed by hovering over their name in FileTrac. A phone number is included on every file and some email addresses are listed in this space as well. In addition, the desk adjuster information is listed in the file notes. Similarly, you can see who the File Manager is on any of your claims by hovering your mouse cursor over your name in FileTrac.